My name is Christopher Downer, and I’m a 24 year-old interface designer currently living in Canterbury, United Kingdom. I work for the awesome Bohemian Coding, who make the Mac design tool, Sketch! Because we’re such a small company, my role is quite varied so I work on all the visual design, but mainly work on the app’s experience and interaction design. Outlining features and working out how they’ll fit into the app, and how they will benefit our users. Along with that, I’ll be putting together graphics and designing pages for the website, help with testing and QA, and doing anything else that comes my way, such as creating a course to teach people how to use Sketch. I’ve been working at Bohemian Coding for coming up to two years in the summer, and I’m so proud of all the work we’ve done since then. Before that, I had worked at Realmac Software for a couple of years, designing a number of Mac and iOS apps. Most notably, Clear for the iPhone. 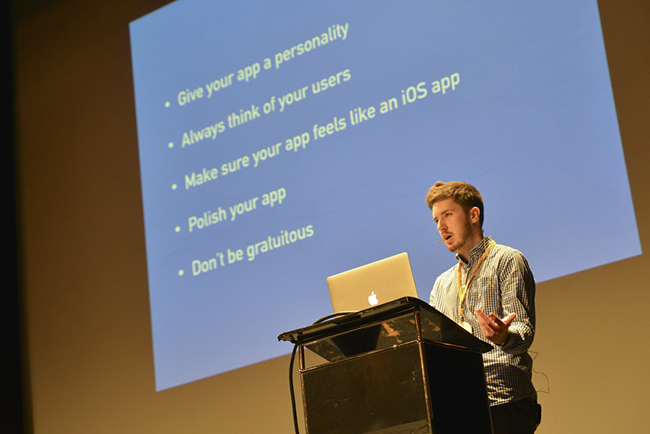 I’ve also freelanced for a few companies and developers over the past few years designing icons and interfaces, I’ve wrote articles for magazines, and even spoke at a conference which was really exciting. I think I was about 15 when I came across a copy of Photoshop so I could create forum signatures, things to upload to deviantArt and graphics for the PC game Football Manager. I stumbled into those various communities and thought “I want to make those things too”. I remember being completely overwhelmed by the complex UI of Photoshop, so I found a couple of tutorials to get me started, and pretty much taught myself the entire thing just from playing around with it for countless hours. It wasn’t so long before I discovered the desktop customisation sites and forums and there I became obsessed about collecting icons and changing all the default ones for the apps I used. When I couldn’t find a certain icon, I thought I’d create one myself and share it. It was utterly terrible but I kept at it, getting feedback and taking that on board. It was from there I discovered UI design and I naturally became curious about that. I was having fun, and realised that it could lead to a real job – being paid to do what was essentially my hobby. So I took it a little more seriously. At the same time I was applying to university, and was looking out for design-based courses, and I found one that I thought would be perfect. I got in, and it wasn’t at all what it seemed, and I hated it. I thought I’d drop out and work for a year, and maybe go try another course. I lined up a job with Realmac as a UI designer and dropped out the course straight away, towards the end of my first year. I never did go back to university, but I was pretty happy with how everything worked out. I think I probably learned more in my first week at work than I did in those eight months. I’m always curious to find out how other designers answer this type of question to make sure my methods aren’t totally unorthodox. I have a notepad that I use quite frequently on my desk where it’s about fifty-fifty when it comes to notes and sketches. I never really used to be a sketcher, and was more in favour of taking down the occasional note, wanting to dive straight into drawing whatever I was working on on my Mac. Now I’m more experienced in what I do, I’ll take more time to draw various options, and work out the pros and cons for each proposal. I focus more on usability, rather than aesthetics, but am still fastidious when it comes to the visuals. Iterating for me is probably the biggest part of my creative process. I used to be so stubborn and thought my first idea after some short mental consideration was my best idea. Now when I look back on those designs, they’re crap and I could have done so much better. I remember at the time caring about what I was designing, but it seemed lazy. If I could iterate on something once or twice, I’d have ended up with something a lot better. I’ve never really been the type of person to wireframe stuff, and would still rather jump into mocking up something in a higher fidelity. It’s just so easy to do that in Sketch. (apologies for the shameless plug) That way, I can then take a screenshot of something and share it with my team, and then continue to iterate on it before I get feedback. My co-workers are probably sick of all the notifications they receive from me sharing stuff. Right now, I’ve been working on re-designing some pages for the Bohemian website and have just finished on the less-fun, implementation stage. Thankfully, someone is on hand to help me out with that as I’m an awful coder. Along with that, I’ve mocked up what a new feature could look like within Sketch, and am about to refine a re-design to something else within the app. That’s all I could say I’m afraid without getting too specific. I wouldn’t want to ruin the surprise! I’m always asked “do you design Sketch using Sketch?”, and the answer is always “yes, of course!”. If I didn’t, I’d have a hard time expecting others to use it. Using your own product is the best user testing you can do too. But I run a special Nightly version of Sketch which means I can use stuff and test it before it makes the public Beta. Aside from that, my most used app is probably HipChat, so I can talk to my co-workers, and discuss everything about the app, share and get feedback on designs, and so on. I use GitHub issues, via Waffle (running through Fluid.app so it’s in my dock) as my to-do list, and the GitHub Mac app itself to commit things to the projects. Other important tools I use are Dropbox, ImageOptim, Coda, Cactus, Screenflow, Keynote, and Licecap. Along with the typical system apps. Moving from an office environment to working from a personal office at home, there’s definitely a lot of things that I miss, but right now working from home is something that works for me. Having a separate room that I use during work hours helps tremendously in terms of focusing on what you’re working on, away from any distractions. I really can’t work from coffee shops or public places as they’re usually too noisy, and sometimes I need to work in silence, especially when trying to work on complex problems. Working remotely means I can go anywhere and still be able to work which does come in quite useful too. I used to spend a lot of time on various design-inspiration sites absorbing everything I saw, but I could never apply that into my own work. Today, I mainly only visit Dribbble where I’m following a lot of my peers to keep up with their work, and a load of super-talented illustrators whose skill always leaves me feeling slightly depressed. I’ve always been interested in art, and whenever I travel I always try to visit at least one art gallery, or design museum, though I don’t really buy any art. If I had to pick a favourite place, it would be MoMA in New York. I’d go back there in a heartbeat. Probably those who used to be active on the now-defunct MacThemes forums I frequented when I started drawing icons and interfaces. Many of the members there went on to work for Apple, Facebook, and a lot of other well-known companies. I don’t think I could possibly link to everyone I’d like to, so here’s who I’m currently following on Dribbble.